In Uros Titicaca Lodge, you rest where the sky, land and waters all meet. 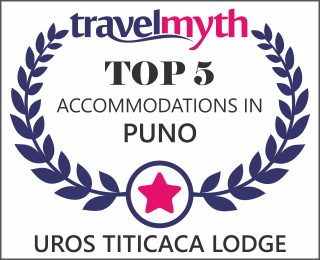 A place equipped properly based in our guests, specially built in order not to alter the natural shape of the floating island, constructed with the same characteristics of the traditional houses of the Uros people, with the root of Totora wich creates the experience of living in a floating boat. Our rooms have unique views to the lake and nature, constructed of totora, with wooden floor, are equiped with big-size beds, private bathroom, shared shower, mattresses and pillows decorated with handmade fabrics, table, curtains, we are even going to put a hot water bottle in the bed for the night and the hammock on the place and the comfortable armchairs invite you to relax and feeling peace of this magical and mysterious place in the lake Titicaca. You can simply relax in your private space and enjoy the majestic views or join other guests in the common areas. If would like some liquors and special wines please let us know by email, it is gonna be with additional cost.